With the approaching Spring Break for Alachua County schools, we are offering programs during the week for students. We open our doors at 8:00am and begin the day which will include exercises and basic fencing instruction. Our coaching staff is assisted by our interns and tournament fencers to ensure everyone has a great experience in becoming familiar with the art of fencing. Our full day program is 8:00am to 5:00pm. Please bring a lunch, snacks and drinks. We offer half days which go from 8:00am to 12:00 pm or from 1:00 pm to 5:00 pm. Many of our tournament fencers discovered their desire to improve in fencing after having attended a camp. We encourage you to give that opportunity to your children. New Website is now official! The Florida Fencing Academy is migrating all of its membership management to a new database. As part of that move, this website is integrated into the database for efficiency of resources. Once the contact database has been fully populated, you will begin to see new email formats and ultimately a website that will allow you to make your payments and get all your information in one place. Bookmark this website and visit often. Let us know if you think of something we could put on the website to better serve the members of the Florida Fencing Academy. The Green Gator Tournament was held on February 9th and 10th at the University of Florida. VISHNU GAUTAM fenced Foil and finished in the upper half of the field in both of his events (Senior Mixed and Div 2 Mixed). We saw a number of FFA fencers in the Saber events on Saturday. Coach TYLER KVOLS-RIEDLER posted another victory as the Gold Medalist of the Senior Mixed event with EVIN SAMY and WILLIAM BOWDEN both finishing in the top 10. Also competing in that event was THOMAS DUPREE, ETHAN KREHL, MATTHEW MILLER, ETHAN WHITE and UMA MCINTOSH. In the Division 2 Saber, EVIN SAMY finished 6th and our other fencers in that event were WILLIAM BOWDEN, THOMAS DUPREE, ETHAN KREHL, MATTHEW MILLER and ETHAN WHITE. On Sunday the action was in Epee with strong fields. The Senior Mixed was a good experience for our fencers ROBERT WAGMAN, NICKOLAY MAVRODIEV, THOMAS DUPREE, WILLIAM BOWDEN and COLE JANES. For the Div 2 Mixed Epee, WILLIAM BOWDEN won the Bronze Medal. Our other fencers in that event were NICKOLAY MAVRODIEV and THOMAS DUPREE. Congratulations to all of our fencers for their achievements and for their sportsmanship. We look forward to seeing them compete next time. Fencers from the Florida Fencing Academy participated in the Papa Ryan's Birthday Bash Tournament in Tampa at the University of South Florida campus on Saturday, January 19th. Congratulations to 15-year-old WILLIAM BOWDEN who won the Gold Medal in the C & Under Epee event. He finished first in a field of 31 fencers and obtained his D rating. Additionally, William also won the Bronze Medal in both the Senior Mixed Saber and the D & Under Saber events. Congrats to EVIN SAMY who won the Gold Medal in C & Under Saber and a Bronze Medal in the Senior Mixed Saber. Congrats also to NOAH HELTON who won the Bronze Medal in Senior Mixed Foil in a field of 28 fencers. Other Academy fencers there included ROBERT WAGMAN who finished 6th in the C & Under Epee, VISHNU GAUTAM who placed 9th in C & Under Foil and in the top half of the field in the Senior Mixed Foil, and Aggie Wagman who competed in the C & Under Senior Mixed Epee. 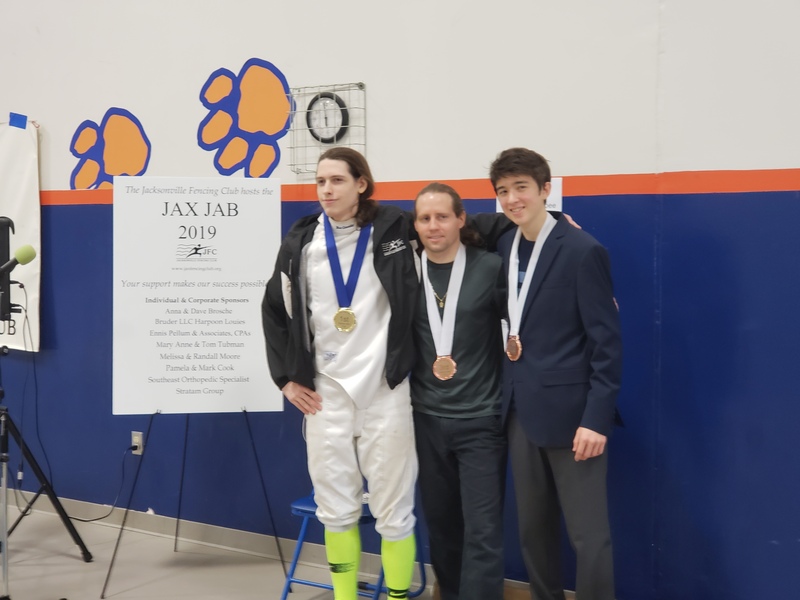 Some of our fencers participated in the Jax Jab Tournament held in Jacksonville on January 12th. ROBERT WAGMAN (father of Aggie Wagman) just won the Silver Medal for D and Under Epee (and obtained his E Rating), NOAH HELTON won a Bronze Medal in the Senior Mixed Foil competition and VISHNU GAUTAM won the Bronze Medal in the D and Under Foil. Also, finishing in the top 10 in their events were WILLIAM BOWDEN and THOMAS DUPREE. And in his first tournament in many years, NICKOLAY MAVRODIEV fenced Epee very well, placing 11th. Now is a great time to join the Academy. We have seen an increase in memberships here in the new year. Some of our students are just learning the fundamentals while our more advanced students are competing in competitions throughout the state. We look forward to seeing your student at the Academy. Good luck to our fencers who will be participating in the tournament in Tampa at the University of South Florida on Saturday, January 19th. This new site is still under construction but a lot of functionality is in place. We are tinkering with the look of the site and we will soon be setting up the financial pieces on the back end so that payments can be made online. Many of our photos are low resolution and will be replaced with higher resolution pictures. If you have ideas for what you would like to see on the Academy's website, feel free to make those suggestions to Coach Harper. Coach Harper is transitioning the program at the Florida Fencing Academy and giving the website a new look is one of the changes. Coach will be able to post updates on this site and also send out email blasts to get information out to everyone. Please be patient as we continue working on it. As the Florida Fencing Academy pursues its goals of growth and reaching out to more people in our community, we have obtained a new database which is driving this website! Along with this database, we are defining our membership levels. These levels currently exist. Current regular attendees may continue from now to August 2019 with your existing payment schedule or you have the option to pay the annual fee and enjoy the lower monthly fee. This new database will allow us to improve our communications with our members and contacts and will give you a portal where you can pay your fees (or donations, thank you very much) online. We hope that this will serve our current members better and enable us to attract new members.